As I and many others have mentioned in previous posts, examining religion and religious life in London has been a big part of our course. Central to increasing our knowledge and understanding of a number of religions has been visiting the various houses of worship. We have visited a few churches, a mosque, a mandir, and a synagogue. We have gone into these institutions with varying levels of welcome, and we have observed a variety of rituals, customs, and traditions. Beauty has also been a recurring theme in the course. Almost all of the houses of worship that we visited had put serious thought and effort into the beautification of their buildings. The only exception was the mosque, but I think it is ok to assume that this was due to the financial circumstances of the community than lack of desire or appreciation for a beautiful space. In addition to all being beautiful, these spaces were all aesthetically very unique. The Mandir was extremely ornate, but not to the point of tackiness or fussiness. All of the stone and teak carvings were well executed and the building as a whole had a feel of luxury to it. The synagogue was a more simple, paired down building, but even as a more streamlined space, it still packed ample visual drama in the floor to ceiling red and gold mosaic behind the ark and tall, dramatic stained glass windows, which unfortunately had to be obscured by anti-terrorism curtains. Comparing St. Paul’s and Westminster Abbey, aesthetically, St. Paul’s is the clear winner. Westminster Abbey is cluttered with tombs and plaques and statues, it is mostly dark and parts do look kind of shabby. Don’t get me wrong, it’s a place of great historical significance and cultural value, I’m not denying that, but on looks alone…. ehhh. St. Paul’s on the other hand, is light, airy, and spacious. It has a regal, elegant exterior and strikes a nice profile. The mosaics on the ceiling close to the WWII memorial were exceptional. As John explained to us, the tesserae had been set in at a specific angle, not flat against the wall, so that the sunlight reflects off of them just enough to allow them to glint and glitter. Perhaps over stepping here, but I think the visual atmosphere, the aesthetics of the particular houses of worship, reflect something of the character of the congregations who pray there. What should we do tonight? We could always go see a play. We have talked a lot about the accessibility of beauty and the arts in London. Free museums, buskers in the tube stations, art on the walls of the tube stations, well-kept public parks and green spaces, free concerts, and, finally, affordable, professional theatre. In the U.S., quality theatrical performances are reserved for the middle-ish and upper classes because of the high cost of tickets. In the UK, much of the arts are subsidized by the government, so even big productions in the West End attract an audience of diverse financial means. Here in London, it is not uncommon for students and other last-minute types to pick up tickets for 15 or 20 quid. In my four weeks in London I have seen four plays, what would have amounted to at least a hundred dollars in ticket prices in the states. It feels so much more elevated that our default entertainment is the theatre instead of the movies. I can’t speak for everyone, but I would take Les Mis over The Expendables any day. I have been fortunate enough to attend a number of performances over the years in the U.S. including theatre, ballet, opera, concerts, etc., but always as a special treat, a luxury. In London, the arts can be a regular part of your life regardless of income, and I think that is possibly the best thing about this city. As fun as dressing up for a special night out and having a fancy dinner can be, I’m even more satisfied in jeans and a sandwich from Pret if it means I can go to the theatre on a regular basis. Each of the plays we saw as a class were very different from one another so it’s hard to pick a favorite. We saw Shakespeare (The Merry Wives of Windsor), a comedy (The 39 Steps), and a somewhat experimental drama (The Habit of Art), outside of class I saw a musical (Les Mis). I wonder, with increased accessibility, (and therefore increased exposure?) to the arts, do more people choose to pursue the arts as a career in the UK than in the U.S. or other parts of the world? Does England have a higher percentage of the population working as actors, artists, or musicians? Thoughts? The way I feel about England’s museums (BM in particular) is the same way I feel about Tom Brady. They are both morally flawed, but too beautiful for me to honestly give a damn. So in that spirit lets forget about the mistreatment of Greece and Bridget Moynihan and just admire the physical beauty and inherent cultural value of the objects themselves. Sure, the jewelry collection in the Victoria and Albert represents the opulence, indulgence, and filthy wealth of the upper classes and royalty, but look how sparkly those diamonds are! 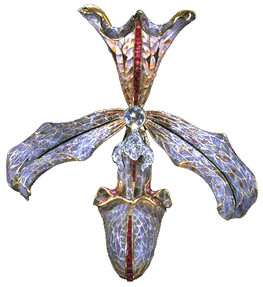 The intricate cloisonne! The colorful enamel! The gemstones! Don’t hate the tiara because a spoiled rich woman owned it, admire it for its elegant design and exquisite craftsmanship. I also must say, setting aside moral issues and countrys’ bruised egos, what is truly in the best interest of the objects themselves is for them to be left alone. Art and artifacts should be handled and moved as little as possible to avoid damage and the acceleration of deterioration. Professor Earenfight, who curates the Trout Gallery and teaches the museum studies course at Dickinson, likes to say that art and artifacts are like the elderly. They are set in their ways, used to their specific atmosphere, and the best thing for them is to disrupt their comfort as little as possible. The bottom line is, virtually all of the objects in London’s museums are priceless and definitely irreplaceable. The transportation of any of these objects across countries and continents is absolutely horrifying from an art conservation/curatorial point of view. In any case, how great is it that we can get into all of these places for free? Sure, government subsidization lends itself to government censorship, but the fact that I can just wander in off the street, as I am, and walk right up to Jan van Eyck’s The Arnolfini Portrait, or Joseph Wright’s An Experiment on a Bird in the Air Pump, or the ship burial treasure from Sutton Hoo, or the Rosetta Stone and countless other treasures more than outweighs any negative aspects for me. London’s collections are among the finest in the world, and they are open to everyone. Now that’s beautiful. Even more so than Big Ben, Buckingham Palace, possibly even the Queen herself, the first thing that comes to mind when Americans hear “England” is pubs. (At least when American college students hear “England.”) I don’t think I exaggerate when I say this. (Do I?) When we first arrived in England, hitting the pubs was at the top of our to-do list and it has pretty much stayed there throughout our time here. Whether we are unwinding at the end of the day, or enjoying a (culturally acceptable! awesome) midday pint, it is almost inevitable that we find ourselves in a pub at some point during the day. In his essay, “The Moon Under Water,” George Orwell describes his ideal pub. Before arriving in England, my romanticized vision of what a pub would be like was much like what Orwell describes. I certainly did not envision strawberry-pink china and children running around as Orwell did, but the familiarity, the “regulars,” and the “atmosphere” were all very distinct in my imagined pub, an amalgamation of bits and pieces, images and texts, from the likes of Harry Potter books and movies, works by Charles Dickens and Shakespeare, paintings, children’s books, and countless other popular culture representations. As American tourists who don’t necessarily know our way around, we often end up in pubs on the main roads in the touristy areas. Also as Americans, we think of drinking as a predominantly nighttime activity, as our bars generally don’t open til 8pm or later. So we were initially puzzled when we discovered that nearly all of the pubs close at 11 and appear deserted after 9pm. We soon discovered that in England, pubs are much more like American coffee shops than American bars. Like Orwell, I believe the best pubs are those off the beaten path, down the side streets and through the alleys. 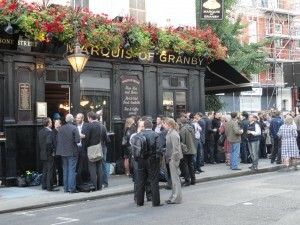 For the best pub experience, get off of Tottenham Court Rd. and go right at the end of the typical office work hours, then you will find scenes like the one pictured above at the Marquis of Granby. The pubs on the side streets are where you will find the locals, where you will see people drinking on the crowded pavement outside the crowded pub, hear snippets of every day gossip and banter, and observe the Brits really being Brits. The National Portrait Gallery is racist, sexist, and snobby, but… what were you expecting? I was, however, surprised by the number of portraits of women I saw. Still not as many as men, but much more than I was expecting. One portrait in particular that caught my attention was the self-portrait of Mary Beale. I was immediately drawn to the richness and depth of the color (this is much more apparent in person). The draping of the Beale’s crimson and steely-plum silk dress suggests a solid, strong body beneath. Her expression is self-assured, yet humble, and she appears competent and adept. After admiring the painting for purely aesthetic reasons, I was even more interested when I read the accompanying text. Beale worked as a professional painter from the mid-1650s, specializing in portraiture. She was the first Englishwoman to become a portrait painter of real distinction. A daughter of a Suffolk clergyman, by age 27 Beale was a very much in-demand portraitist, particularly for the clergy. Beale’s husband Charles, whom she married at age 19, was also a painter, and he acted as a studio assistant to Beale as well as kept records of all of her commissions. In the self-portrait above, a painter’s palette hangs on the wall in the background, referencing her profession, and she holds in her hand a canvas depicting her two sons, Bartholomew (1656-1709) and Charles (1660-1726). It was so satisfying to see in the National Portrait Gallery a portrait of woman who was valued for something more than royal or aristocratic blood, or being a wife or mistress to someone of royal or aristocratic blood. How incredibly progressive, in the 17th century no less, for a woman to be honored and admired for her work as something other than being a madonna or a whore. To me, Mary Beale resembles quite closely the “ideal” modern woman. She was a wife and mother, but she was also a respected, talented, accomplished career woman, and that is what takes the historical precedence. Schubert, Gudrun. “Beale, Mary.” In The Oxford Companion to Western Art, edited by Hugh Brigstocke. Oxford Art Online, http://www.oxfordartonline.com/subscriber/article/opr/t118/e213 (accessed September 20, 2010). London’s public parks are impressive, in their size, beauty, and sheer number. 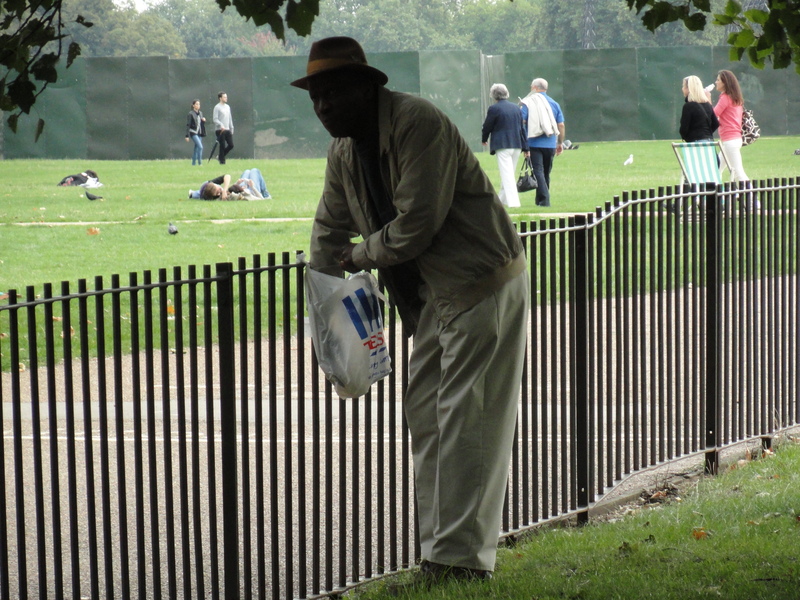 Most people go to these parks to play sports, have picnics, hang out with their mates (both kinds), sit and read under a tree, etc., but my favorite park activity is people watching; and nowhere in London is the people watching better than in Hyde Park’s Speaker’s Corner. Speaker’s Corner is like an internet chat forum come to life, attracting people from every imaginable social background and point of view. Immaculately dressed women toting around their four figure handbags walk by elderly Sikh men in skull caps with long, gray beards. Middle school aged children in football jerseys weave between bikers and joggers. Indian grandmas in wheelchairs are pushed by their grandkids past punk teenagers in six inch platform boots. 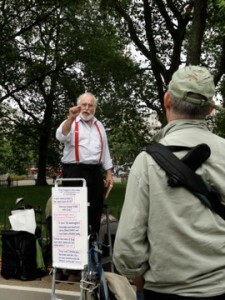 London’s parks truly attract all kinds, and Speaker’s Corner is the ideal place to find a varied audience if you have something to say, simply set up your little stool, hop on, and begin your diatribe against the government, the media, the cursed masses, who or whatever. If you have anything even remotely interesting to say, a crowd will soon form around you. Wearing a funny costume doesn’t hurt either, the crazier the better. I’ve simply strolled through most of the parks here, stopping every now and then to admire a flower or dodge a pile of dog poop, but Hyde Park caught my attention and kept it. Right across from the tail end of the Oxford St. madness you will find the Marble Arch, and beyond it a massive expanse of green space. Speaker’s Corner is lodged conveniently in the middle. The first character I encountered was a militant African man speaking out against the war in Iraq. He looked to be about 25 or so, and around him stood a rather sizable crowd. There was also a group of four physically fit 20 somethings advertising a personal training service and attracting quite a crowd with their boxing gimmick. One of the men held up a pad on each hand and challenged people in the crowd to get in 200 punches in one minute. 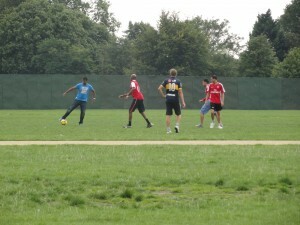 A group of south asian men egged each other on in friendly competition as the crowd laughed and cheered. I was asked to participate, but declined the request. After I had had my fill of watching overweight middle-aged men try and fail to show off athletic prowess, I moved over to listen to a capital C Crazy preacher and the bemused, laughing, and heckling crowd around him. My favorite speaker was a grizzled old man sartorially channeling the Gorton’s Fisherman. He had a much smaller crowd around him, an interesting mix of homeless people and business men in suits and ties, and me. He wasn’t so much Speaking as having an intimate conversation with his little crowd, discussing poetry and painting, interspersed with personal anecdotes of questionable validity. Past all of this, Hyde Park is like all the rest, and if you walk in far enough you will undoubtedly be able to stake out your own patch of serenity. Muslin women in full burkas sit and read, couples sit shoulder to shoulder on blankets, its all really a very nice scene. I guess the behavior in the park could be described as English, in that, aside from the liminal space of Speaker’s Corner, people seem to keep themselves, on the whole, its all very orderly. As Kate Fox says in Watching the English, there is nothing the English dislike more than “making a fuss.” We see evidence of this in the English propensity for dirty looks and harrumphing in incidences of queue jumping, rather than directly confronting the social deviant, and apologizing incessantly when asking anyone in the service industry for the tiniest bit of service, among other things. Why, just moments ago, as I was asking Pat a question about the unfortunate current state of the blog site in a very hushed whisper, I was given the disgruntled throat clear by the elderly man sitting a couple seats to my left here in the Humanities Reading Room in the British Library. At the British Museum, which attracts a great deal of tourists, you would think the employees would be more accustomed to handling the directness of foreigners, but you would be wrong. I’ve been amassing quite a collection of postcards since I’ve been here in London, and in my opinion the British Museum gift shops offer some of the most attractive options. They are, however, rather pricey at 60p a pop, so I was delighted when I saw a significant amount of postcards available through the 10 for 1 pound deal. I was decidedly less delighted when I noticed that a few of the postcards I had paid full price for were included in the discounted selection. So I sifted through the postcards I had purchased and fished out the ones that were on sale, so that I could take them back to the counter to return them. The saleswoman I spoke to said they didn’t do returns, I then explained the issue to her and she said there was nothing she could do about it, with the faux-polite “so sorry” of course. Being a student on a budget, I was not about to resign to paying 60p for something being sold for 10p so I requested to speak to a manager. The look of complete befuddlement and horror that spread across her face when I didn’t simply sigh and walk away with my over-priced postcards was fantastically English. The manager did arrive, and he corrected the problem, but not without displaying that he was obviously annoyed with me, telling me how complicated of a process he was about to undertake. As other customers queued up behind me at the till, he would sigh and say to them, exasperated “There’s another till ‘round the corner, it is going to be quite awhile.” The whole scene was like something out of a bad sitcom. 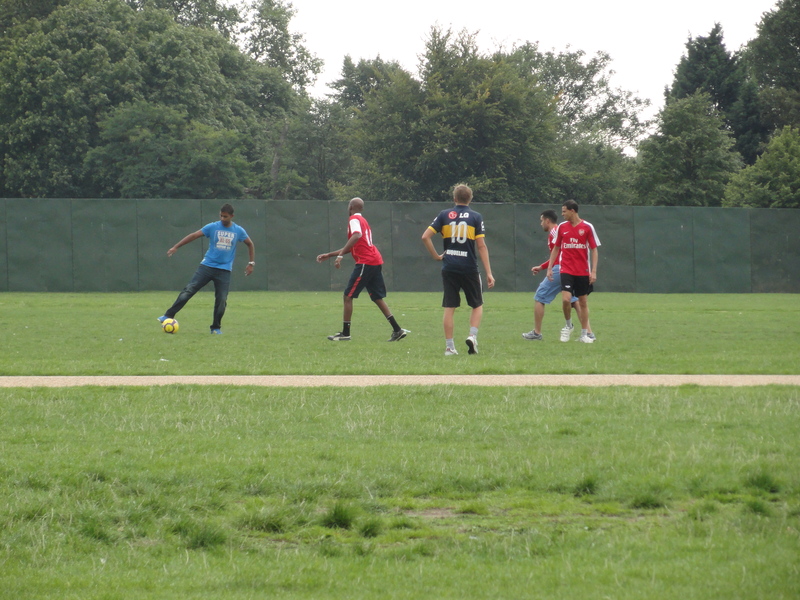 Within the overarching theme of “Community” in our London course, we have talked almost ad nauseam about religion. Not only have we visited churches, a Hindu mandir, a mosque, and a synagog, but the topic of religion and its related issues come up daily in discussions amongst ourselves. (Completely unprovoked by Professor Qualls!) Several members of our group are particularly religious, and their world views and values reflect this. The strength of these individuals’ faith and beliefs fascinate me. It amazes me that people my age seem to have already got it all figured out, they know where they stand, when I haven’t even really begun to piece things together. Religion has always been a topic of interest to me, because I have always struggled with it. There are just so many questions that can never really be answered in indisputable, concrete fact, not to mention so many faiths to choose from. Somehow, I always have a hard time… well, buying it. So for a long time now I have pushed religion to the back of my mind, I’ve tried to avoid the uneasiness and discomfort that comes with thinking about it. But now, in this environment, it is unavoidable. As a Jew (at least secularly) this is a particularly hard time of the year for me, as Rosh Hashanah has come and gone, unobserved by me, and Yom Kippur fast approaches. Since I have gone to college and it has been up to me whether or not I attend services for the high holidays, I so far have not. This does not mean, however, that I haven’t still felt pangs of guilt when I have watched the holidays come and go, no matter how hard I try to feign indifference. I feel deeply connected to my Judaism culturally, and I would consider it my ethnicity more so than generic “white,” but it feels decidedly half-hearted without the spiritual connection. Since I’m already on the brink of pouring my heart out on a class blog, I may as well just tip the whole damn pot over. As some of you may have noticed, I became visibly upset during our visit to the synagogue the other day. I’m not sure what came over me, exactly. I was shocked that I reacted so strongly to something I’ve seen before. At every religious institution we have visited, we have seen very blatant physical manifestations of the subjugation of women. Although my synagog at home does not separate the men and women, and we have even had a woman rabbi, the fact that such discrimination (and for me, outright belittlement) occurs anywhere in the Jewish faith AT ALL deeply upsets me and creates an enormous obstacle for me to be able to come to full acceptance. It’s not just the head coverings and other “modesty” clothing articles, even the separate seating I can almost tolerate, (separate is NOT equal, think back to the treatment of African Americans in the U.S. not long ago) but its the fact that women are denied leadership positions and the top level and most sacred aspects of the religion. (We have seen this in every religion we have looked at.) As Jews, we are taught that the Torah is the most sacred, wonderful thing we could ever experience. It is supposed to hold all of the information we need, all the rules by which to conduct ourselves, all the history of our earliest ancestors. In Orthodox Judaism, women are not allowed to read from the Torah, and they are not allowed to have a bat mitzvah, the rite of passage comparable to a bar mitzvah which marks a Jew’s transition from child to adult. (The rules vary from congregation to congregation, but I am speaking here of the most extreme, by the book, traditional interpretation.) If there really is a god as we are made to believe, I cannot accept that such a “perfect” being would condone sexism in any way, shape, or form. How is it at all logical, that something such as the Torah should be denied to half of the Jewish population? (as the orthodox see it). Our guide at the synagog only increased my distress with his attempts to convey that Judaism is a matriarchal religion. It’s really not. Judaism is traced through the mother only because it’s always obvious who the mother of the child is, whereas the father was much dicier to verify before the age of paternity testing. At the synagog we visited, women are not allowed to read from the Torah. They may be bat mitzvahed, but it is a much shallower, lesser version. I tried to speak to our guide about this after he had given his long-winded, unbearable shpiel and he literally walked away from me. I have witnesses. It could have been that he just needed to catch up to lead the group, but instead of saying so and offering to discuss it further later, he simply ran away. I have tried to ask these questions numerous times, to many different people, and never, ever have I gotten a satisfying answer. We have heard the argument that it is cultural rather than religious, but, looking at it pragmatically, culture should be adapted to contemporary times if there is no conflict with the scriptures. Why wouldn’t you move forward if nowhere does it say you can’t? Why do women put up with this? Open, institutionalized racism has been virtually wiped off the map, why hasn’t sexism? People who believe that women cannot read from the Torah, or be rabbis, or become a priest, or the Pope, or an Imam, need to quit squirming around the issue and say outright the clear message they are sending: You are less. Leaving the Arran House, we decided to travel the Northern Line from Goodge Street to London Bridge. 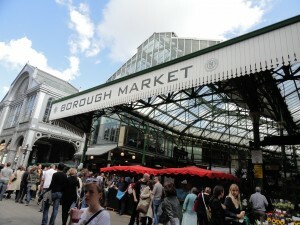 From there it was a quick walk across the street to Borough Market, which includes Jubilee, Green, and Middle Market. Borough Market can be found tucked behind the Southwark Cathedral. 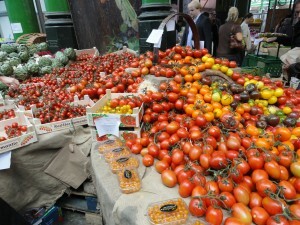 Before we even fully entered the market, we were hit by a blast of smells. 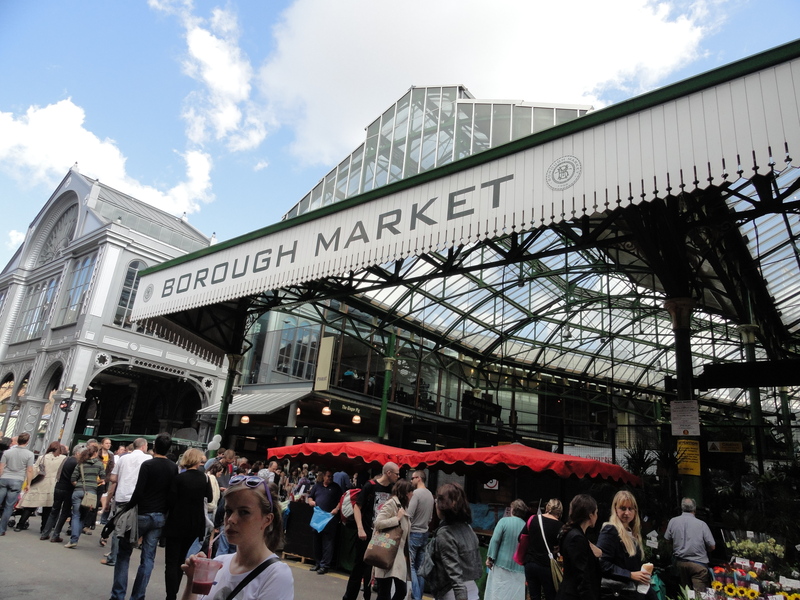 Borough Market is an upscale, artisanal food and foodstuffs market, featuring booths selling everything from specialty fromage, to fresh produce, seafood, wine and beer, and traditional and exotic meats– ostrich! The market was extremely crowded, with people walking through shoulder to shoulder. We were separated from each other at several points due to the shuffling throngs of people. Due to the high-priced nature of the vendors, the patrons (minus tourists like us) visiting the market appeared to us to be of a higher socioeconomic class. Racially, they were fairly homogenous. Slight variations could be seen from booth to booth, depending on what was being sold. 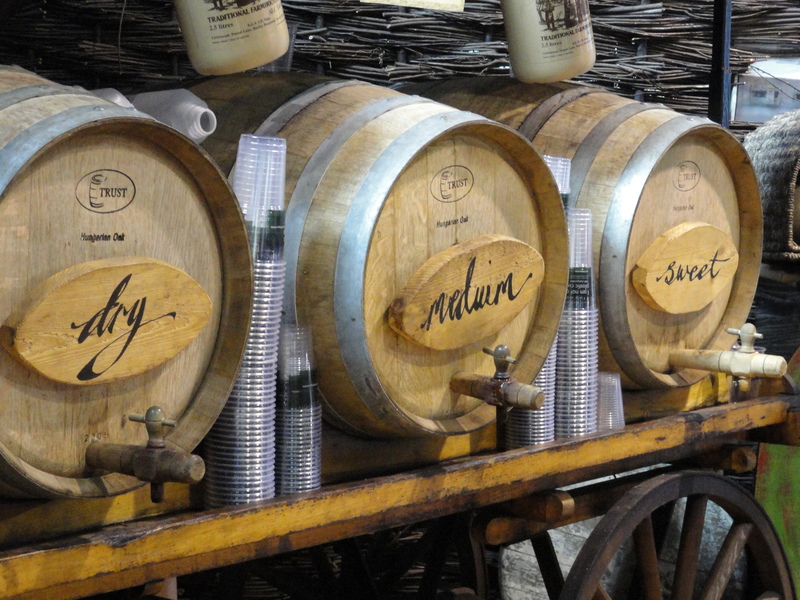 For example, Mikey was passive-aggressively asked to leave a wine booth as he was writing in his notebook, while the booths selling cider tended to cater to the less affluent. There was almost every sort of food one could hope to find at a market, so in the blog we will just document some of the more surprising or delicious options. At another stand a giant, sliced, puffball mushroom was available. Exotic and expensive fruits such as whole figs and pomegranates were available, and we passed a crepe stand offering fillings of the savory, spicy and sweet variety. Whole fish were for sale, along with squid, scallops and halibut. We were intrigued by a stand vending elderflower cordial, though, as with most of the items of intrigue, it was pushing five quid for even a small drink. At a fine meat stand, there was a sign touting the benefits of the ostrich eggs they were selling- including the rather astounding fact that one ostrich egg is equivalent to twenty chicken eggs- as well as offering a kangaroo burger. We saw duck eggs and whole game mallards, whole hams and various wild boar meats. The upscale beer store was rather astounding as well. 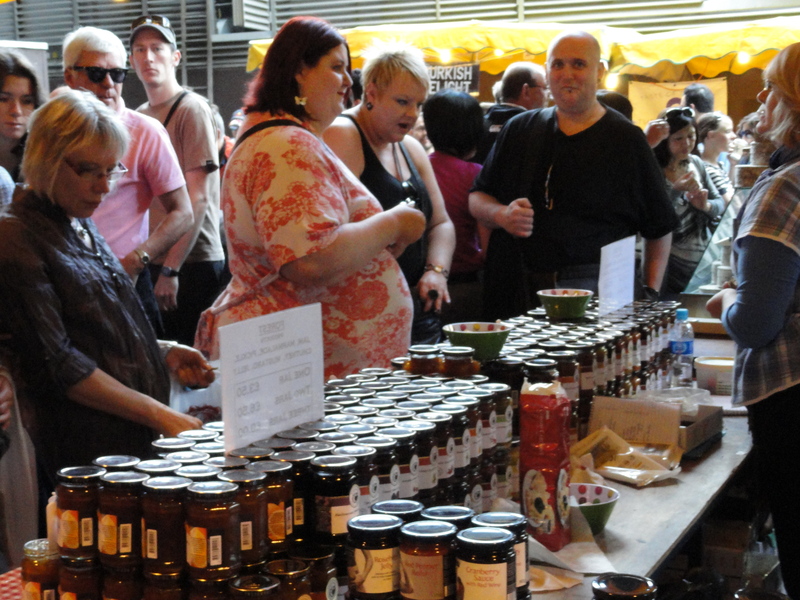 If anyone is looking for high-quality specialty foods, the Borough Market is the place. It is lively, expansive, and an a fun experience. Upon departure from our safe haven at the Arran House, we attempted to navigate the streets of London to no avail. While aimlessly wandering, we stumbled upon such landmarks as the British Museum and the University of London, essentially touring the greater London area for a thorough hour. After questioning a few pedestrians and going in the wrong direction on more than one occasion, eventually we made it to the Euston Square Tube Station. We boarded the train and set out for the Barbican stop located on the Metropolitan Line. The name Barbican was chosen for the train station in 1968 as an alternative to the former name of “Aldersgate”, renamed for the famous Barbican Centre, the largest performing arts centre in all of Europe. The general feeling of the Barbican area of London was a sophisticated, high class, multi faceted slice of society in which the arts and business thrive. We visited the Barbican Centre, a beautiful achievement in the arts (among them, surrealistic modern art, dance, music, and theater). We briefly viewed an exhibit that was on display courtesy of John Bock. In the back of the Centre was a great fountain display accompanied by hipsters and coffee shop-goers lined with elegant churchlike buildings from the days of old. When we made our way further towards the Business and Commercial area of Barbican, we found many towering, glass company buildings. Even further down the road we encountered many shops before we embarked on the journey home via the Tube. On the way back we enjoyed a scrumptious local Italian-ish dinner at a restaurant near the Euston train station. After the meal, we hopped back on the train and took the Northern Line of the Tube from the Euston station to the Goodge St. station, and returned safely home to the Arran House (in the pouring rain).